The Jehovah Jireh Rock is located under the Love Lives Boulder. Pastor Jung Myung Seok brought this rock in from the same location where he found the 33-ton Rock. We found both of these rocks at the foot of a mountain that was 300 m away from the village. Originally, Pastor Jung set this rock in a different spot from where it is now. But at that time, the Holy Son inspired him and gave him instructions to move it. So he moved it to the Ambition Masterpiece according to what the Holy Son told him. 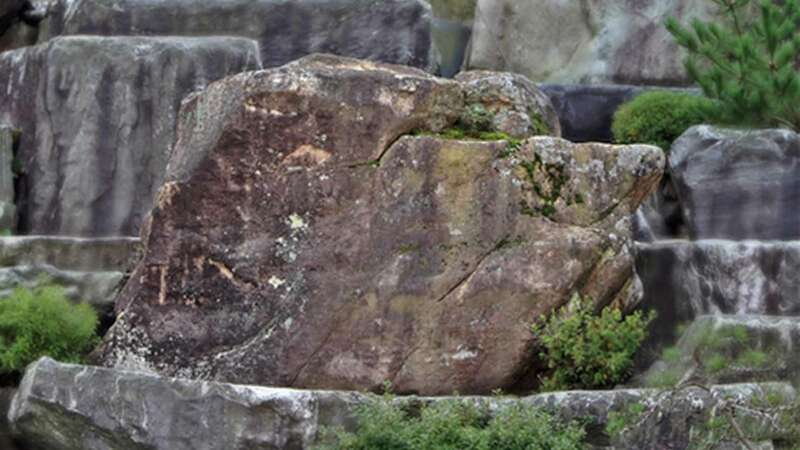 When Pastor Jung looked at this rock at first, he saw the form of an abstract face. So he temporarily named it the Picasso Rock. At that time, the rock didn’t have any particular special meanings. In 2012, when Pastor Jung was reorganizing the stories of the rocks in Wolmyeongdong, he asked the Holy Son about this rock again in detail. In response, the Holy Son told him to rename the rock the Jehovah Jireh Rock. This rock embodies the fact that God prepared all the rocks and boulders in Wolmyeongdong for the construction of the temple. God made every rock and boulder in Wolmyeongdong art pieces. That is why Pastor Jung named this rock the Jehovah Jireh Rock. The meaning to Jehovah-Jireh means, “The Lord provides.” Truly, God has provided all the rocks in Wolmyeongdong. They are all meaningful art pieces that all people can enjoy forever.